This summer, I’ve been working on finishing up our first community read, featuring the book, The New Jim Crow by Michelle Alexander. We’re excited to share it with you, including essays and letters from participants reflecting on the book. This project was started by Rachael, who has since graduated from Cornell – but we’ll be getting some reflections from her as well. 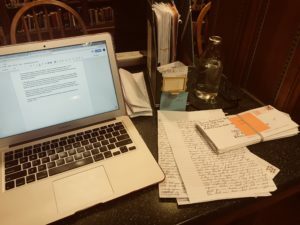 Since it started, prisoners from all over the US have been writing and sending in thought provoking essays in response to each chapter of the New Jim Crow – and I’m continuing Rachael’s work in reading through the last few batches and selecting some highlights for the upcoming compilation. Abby’s workstation writing up essays from the New Jim Crow book club. The book club has generated many amazing responses, but there is not enough space in the compilation for all of the deeply intelligent pieces we’ve been getting. But, don’t worry, we’re preparing a lot more great content to be featured online on our website! If you’d like to know when our big recap post is published, including reflection pieces from prisoners that I’ve been compiling, sign-up for our newsletter in the form below.